Cereal Treats? Really? Can’t We Just Call Them Rice Krispie Treats? It drives me crazy when people call Rice Krispie Treats, Cereal Treats. We all know that they are Rice Krispie Treats. Cereal Treats could really be any cereal mixed with marshmallows. But, Rice Krispie Treats, are a class above all the rest. And of course, I am speaking of homemade Rice Krispie Treats…not the fake, pre-packaged stuff. None of that for us. Only homemade, real, true Rice Krispie Treats. I love making Rice Krispie Treats at home. Just love it. Once, I made a batch full, filled up by 13 by 9 pan and then proceeded to eat more than half of the pan in under 10 minutes. Yeah, I definitely didn’t feel good. Since then, I have learned to pace myself and resist the temptation of overeating these pieces of goodness. While in Blairsville, I enjoyed a very large Rice Krispie treat at Betty’s Country Store and also picked one up at Hansel & Gretel. Since I basically ate the entire RKT while walking around Betty’s, I did not take any photos. Rather, for this review, we will discuss the RKT I purchased at Hansel & Gretel in Helen. When we first started going to Hansel & Gretel many, many years ago, the only item I would ever get would be a White Chocolate Covered Rice Krispie Treat, served on a stick. In all of our visits since, I always pick up one of these and have yet to be disappointed. 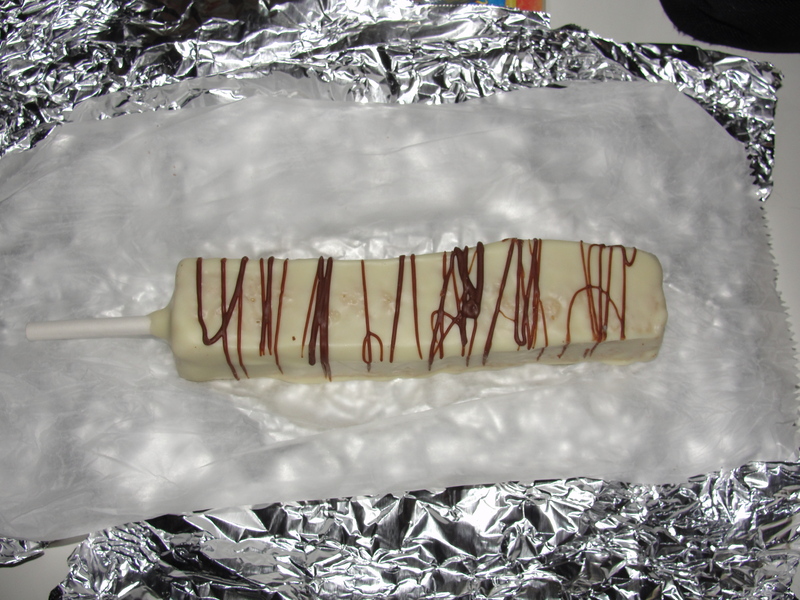 The RKT is completely covered with white chocolate and has a milk chocolate drizzle on top. While the treat itself is not huge, it is more than large enough to satisfy. I purchased this in Helen but did not eat it until I was back home in Naples – yet, it stayed very fresh the entire time. I was anticipating eating this RKT the entire day and could not wait for my after-dinner workout to be completed so I could dig in. I started the RKT and was pleased that it was still very moist on the inside. 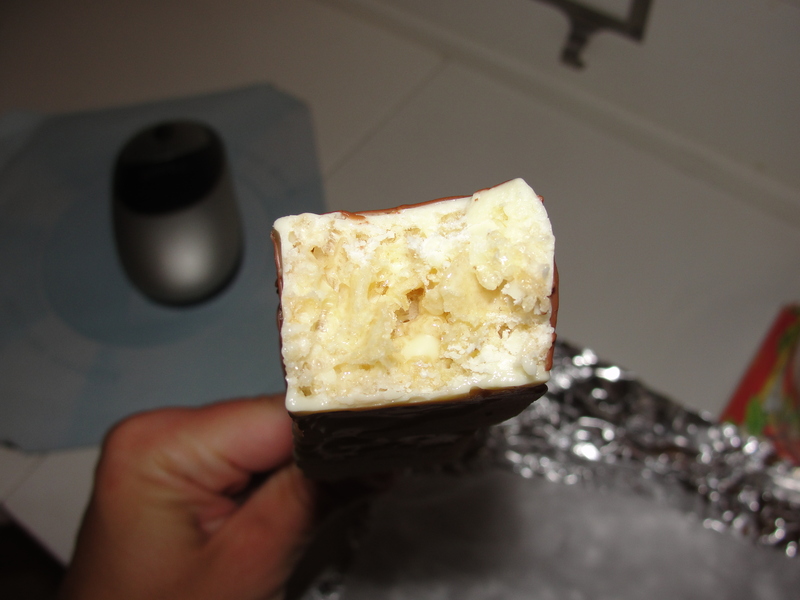 Even though the RKT was completely covered in white chocolate, the chocolate was not to the point of being overpowering or too much by any means. The layer was light, simple, delicate yet provided a fantastic additional flavor. 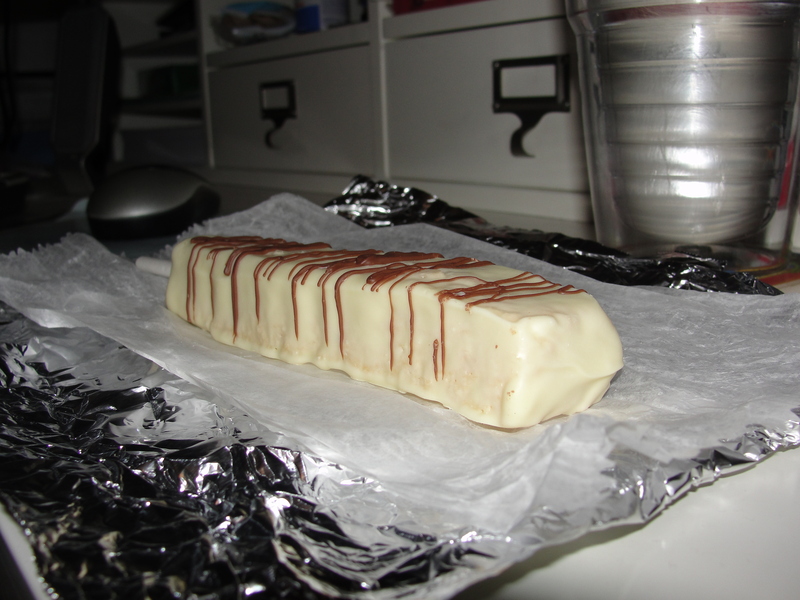 Each bite contained a very large amount of RKT and a perfect amount of white chocolate accompaniment. I could not really taste the milk chocolate drizzle but this is really due to the fact that white chocolate is very sweet. This white chocolate was certainly sweet and had a lovely flavor both while I was chewing each bite and after I had swallowed each bite. I also appreciated the smoothness that I received from the white chocolate. The interior of the RKT was the important part – the actual RKT. Hansel & Gretel did a great job of equally mixing the rice krispies with the marshmallows. While I normally prefer more marshmallows to rice krispies, this is undeed in this RKT since the white chocolate provides extra flavor. The RKT was very soft but not to the point that it did not hold up. The krispies were krispy and the marshmallows, while not warm, still had a gooey consistency. The marshmallows were perfectly sweet and I really appreciated the overall flavor I received from the rice krispies, marshmallows and white chocolate. Many times flavors, while on their own good, just don’t work together. Hansel & Gretel does a great job of nailing this down. RKT have been and will always be, one of my favorite treats of all time. When I was working at Vineyards Park, I would always hope for a batch of warm RKT waiting for me when I arrived from a long day outside. I am happy to say that did happen on a few occasions. Otherwise, I am more than happy to make my own and always try to find a reason to do so. The RKT at Hansel & Gretel was home made with a lovely, sweet addition of white chocolate. This has always been my go to item at Hansel & Gretel and it will continue to be for many visits to come. Mmm. I think I just may need to make some RKT this weekend. Mmm mmm. And, one final note, they are Rice Krispie Treats…Not Cereal Treats!